I stumbled across these sacks one day at Walmart while preparing for a trip and I’m so glad I did! 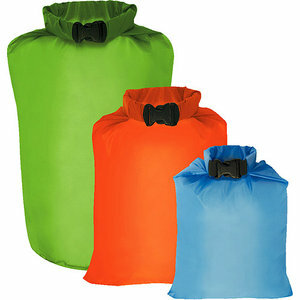 There are a number of Dry Sacks available on the market, but these are great because they are so affordable. For only $10 – $15 at your local Walmart, you get a set of 3 sacks, each in a different size and color (7.75″ x 13″; 9.5″ x 15.5″; 6.75″ x 10.75″ x 22″). I’ve found that they are perfect for using as clothes bags, food bags, and first aid or hygiene kits. They are super compact and ultra lightweight, which makes them perfect for backpacking as well. And if that’s not enough, they keep your gear dry if you ever flip your canoe or stumble while fording a stream. Do yourself a favor and go grab these on your way up the trail. You’ll be glad you did. Previous postUltralight Backpackin’ Tips by Mike Clelland!